Footage from attempted terror attack in Old City on Friday. 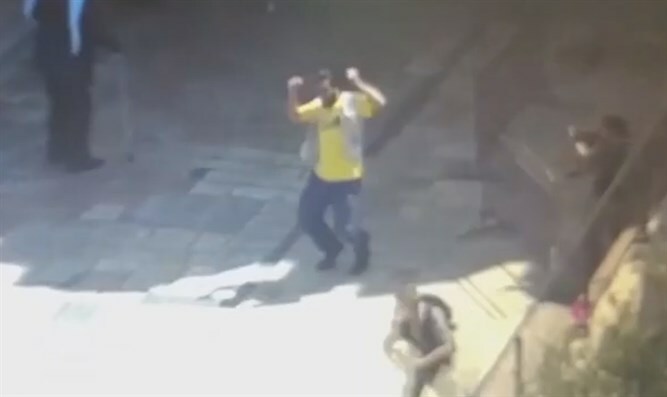 After Jordanian officials condemned Israeli police for shooting dead a terrorist in the Old City of Jerusalem, Israeli authorities released footage of the man brandishing a knife and attempting to murder police officers. The 28-year old terrorist, Saeed Amro, a Jordanian national, had entered Israel as a tourist on Thursday. However, in a video released on Sunday, Amro can be seen charging an Israeli police officer before being neutralized.